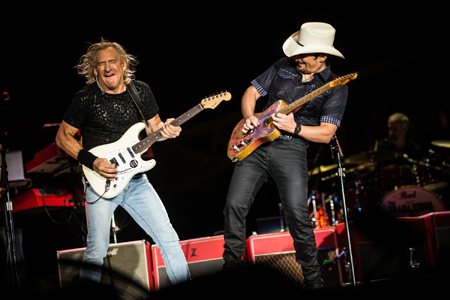 Country superstar Brad Paisley was the opening act for The Rolling Stones Zip Code Tour stop at LP Field in Nashville on Wednesday evening. He impressed the crowd with his guitar chops as well as his special guests. Carrie Underwood joined Paisley on their #1 hit duet, “Remind Me,” and Joe Walsh of the Eagles played his classic “Life’s Been Good” and stayed on stage to play on Paisley’s “Alcohol.” Later, during the Rolling Stones show Paisley was the special guest on “Dead Flowers,” trading verses with Mick Jagger and guitar licks with Keith Richards and Ronnie Wood. 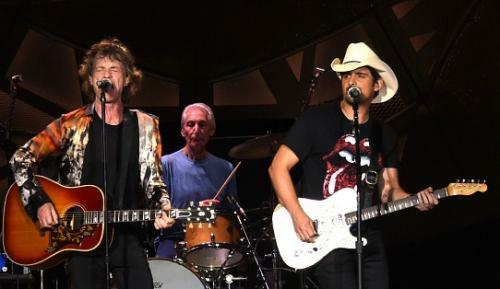 Brad Paisley had a big night onstage in Nashville on Wednesday (June 17), not only opening for the legendary Rolling Stones, but joining them onstage for a song. Paisley warmed up for the Stones at their concert at Nashville’s Bridgestone Arena, which was part of their ongoing Zip Code tour. Carrie Underwood joined him onstage during his set for “Remind Me,” and Joe Walsh from the Eagles came out to jam with Paisley on one of his own hits.